In one of my last posts, I praised WordPress as a must-know tool for marketers and talked about how it can help you quickly prototype a website project without technical skills. In this post, I want to go into detail about how this prototyping can be done with the Enfold Theme, one of the most-often sold themes for WordPress on Themeforest. What makes the Enfold theme special? There are thousands of themes available. Why is this one so successful? Configuring Enfold and customizing it to your needs is very easy. I have played around with a lot of themes and often needed hours of research to get one to a state in which it looked as-advertised. The Enfold settings dashboard is easy to understand even if you are new to WordPress. The experience Enfold creates for the visitor to your website is great. Enfold gives you tons of options for customizing your site, and it always makes sure the site provides a great user experience–both on the web and on mobile. From simple one scroll landing pages to a multilingual corporate page to an online shop, Enfold makes it all possible. There are lots of themes that are very good at fulfilling a specific use case, but Enfold covers many of them and often does a better job than other themes that cover only one use case. Most themes leave you empty-handed after you have installed it. You have to add some demo content and follow a guide (if available) on how to start customizing the theme. Not so with Enfold. 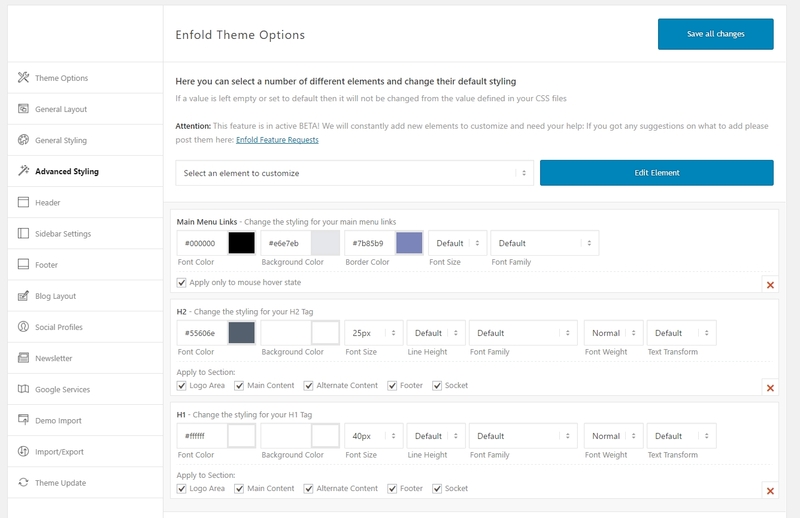 Just head over to the theme options panel and import a demo page you like. Instead of wasting hours of research and adding dummy content, you can kick start-your project this way. Enfold comes with a drag and drop layout editor called Avia Layout Editor that makes it super easy to build a responsive website without technical skills. It just makes playing around with this editor and building a page fun. This is also very important if you are going to train other people on how to build pages with Enfold. It is easy to learn. If you need advanced customization and you can’t find a solution on your own, you can access the official Enfold support forum, which will get you an answer within hours. Always search for your question first–the chances are high it has already been asked and answered. Enfold has a large user base, and there is a company further developing the theme. If you decide to build your website on Enfold, you can be sure to get new features a few times a year. Updates can be made by connecting your Themeforest Account within the WordPress dashboard. Since I first used the theme, it has changed tremendously. Just a few of the features that have been added since I started using it. The possibility to connect a Mailchimp account was added as a built-in feature. New demo pages were released and can be imported within the theme. An advanced styling editor for the most commonly used elements was added. If you search the web for reports on page performance and Enfold, you will discover that most people report that loading time of the theme is good. Especially when you compare the feature-richness you get, this means the Enfold team is delivering excellent code quality. As with every WordPress project, you can install a caching plugin, and it will work well with Enfold. Lots of themes require you to install other plugins (often more than one) to get the features you were promised. There is no such surprise with Enfold. Install one theme and get tons of features. Also, Enfold works well with the most commonly used plugins like WordFence, WPML, and Yoast. Enfold has hundreds of options, and combining these makes it easy to create your own unique website. Here is a list of features I think are supercool. the option to set a diagonal section border. You can divide pages into columns and easily customize this later on if you discover your content does not fit or you need to display more or less content. Once you get used to Enfold, you will use this very often to quickly recreate or re-layout pages within minutes. You don’t have to be a web designer to customize your Enfold site. 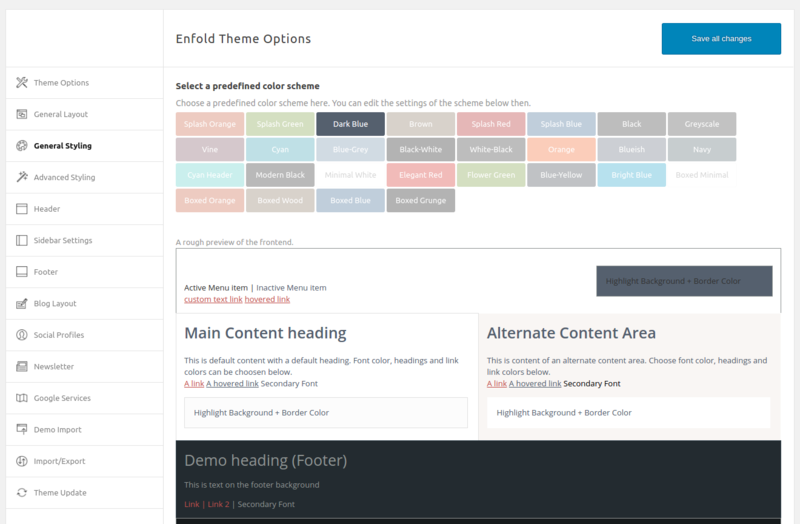 You can customize all important areas of your site from within the Enfold Theme Options Panel. After defining the basics like the logo and header, you can work through more advanced options like how specific headlines look or what the hover link color is. This makes it really easy to apply your brands CI to your Enfold site. Enfold pays attention to the needs of online marketers. Want to display a telephone number on top of your header so your customers could easily reach out? Enfold’s got you covered. Want to connect your Mailchimp or Google Analytics Account? Enfold’s got you covered. Want to add links to your social media profiles in the footer? Enfold’s got you covered. I could go and on–Enfold has lots of features that business owners will need. If you are looking for a pure and rock solid blogging theme, Enfold may not be the right choice. Enfold is supercool for creating awesome websites and also offers some features to customize a blog. But the blog is definitely not the root cause to start using Enfold. The options of how to customize a blog are limited compared to the hundreds of options you get for building webpages. If you just want to host a simple blog together with your corporate page, it’s good enough, but if the blog is the central element of your site, you might want to take a look at other themes. Enfold gives you freedom, but you could also get lost in the richness of its features. Here is how you can best approach your website project with Enfold. WordPress in general and Enfold in particular make it so easy to just jump into setting up a site and working on a site structure and its look and feel that you may forget what use the site has to fulfill. Take an hour to think about the content you want someone to consume on your site. What should the structure of a single content page, the front page and the navigation look like? If you have the basic idea, use a piece of paper or a tool like Balsamiq to create a mockup. Then start prototyping your project with Enfold. If this is your first Enfold project, do not start building the whole site from scratch. First, take a look at all the available demo pages and decide which is closest to your needs. Then import that demo within the theme’s options panel. If you don’t need to create a whole website project on your own, use Enfold for prototyping your project to get a feeling of how your content might fit in a certain page structure. Often you will have a specific site’s design in mind and later discover that it does just not fit for your needs. If your goal is not to create webpages, Enfold helps you build knowledge of how the process of creating a site works. You can get better at writing briefings for future projects you may do with your agency. Having a designer or coder help you do some of the advanced customizations can make all the difference. Because thousands of sites run on Enfold, you want to make sure your site perfectly reflects your brand’s CI and does not look like every other Enfold demo page. As I noted in the introduction to this post, Enfold is updated a few times a year (like WordPress) and provides new features. Updating Enfold means you get new possibilities to further customize your site. If Enfold gives you a new way to make a layout or to customize a background setting, it means that there is a larger trend behind it. You may want to evaluate those features from time to time. I hope I have given you reasons to evaluate Enfold and a few tips to get started. Let me know how it goes. Also, check my blog on how to choose a WordPress theme. 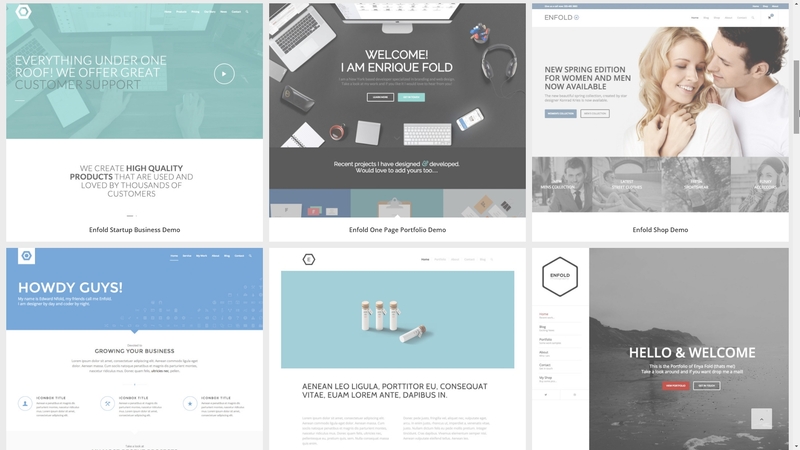 Check out the Enfold Themeforest page and its hundreds of 5* ratings. At Fresh van Root, we approach website projects from a content marketing perspective. Here are a two webpages we helped clients to build with Enfold. Also, check the showcase thread at the Enfold support forum to get further inspired.